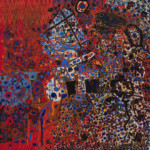 James Cohan will present an exhibition of important paintings and works on paper from the 1960s by Lee Mullican. During the late 1940s and 1950s, Lee Mullican, along with fellow painters Wolfgang Paalen and Gordon Onslow Ford, constituted the short-lived but influential Dynaton collective, which culminated in a 1951 exhibition at the San Francisco Museum of Art. After the group disbanded in the mid-1950s and his connection with Paalen and Onslow Ford waned, Mullican’s aesthetic shifted but his spiritual concerns remained unchanged. Through this non-specificity, Mullican activated a meditative spirituality that he continued to define throughout his career. Mullican’s works from the latter part of the 1960s, which constitute the majority of this exhibition, display his willingness to experiment with bold forms and a diverse palette. The works on view explore the same thematic concerns as outlined in his 1953 statement, yet these paintings represent an important stylistic change, incorporating greater variations in line, shape and color. The quiet cohesion of his monochromes painted in 1962 and 1963 yield to decentralized compositions in “Shatter Passage” (1965) and “Space Mix” (1967). The later paintings reveal a different way of seeing, capturing the minutiae of interlocking, seemingly organic systems. Mullican’s productive and contemplative gaze was central to his practice, allowing him to access both the subjective experience and cosmic sublimity of art. 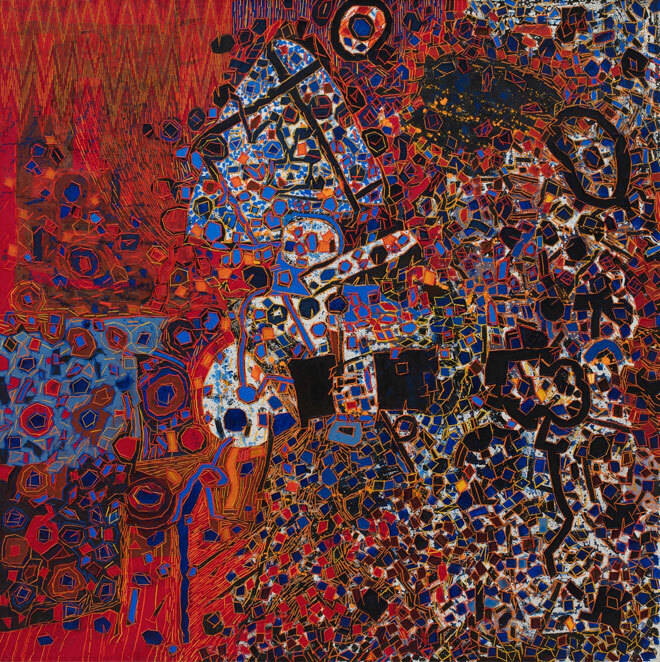 Lee Mullican was born in Chickasha, Oklahoma in 1919 and died in Los Angeles in 1998. He attended the Kansas City Art Institute after transferring from the University of Oklahoma in 1941. After winning a prestigious Guggenheim Fellowship in 1959, he spent a year painting in Rome before returning to Los Angeles where he joined the teaching staff of the UCLA Art Department in 1961, keeping his position for nearly 30 years. He divided the later part of his life between his homes in Los Angeles and Taos, New Mexico traveling internationally and co-organizing exhibitions at UCLA. Mullican’s works are included in the permanent collections of the San Francisco Museum of Modern Art, the Whitney Museum of American Art, the Los Angeles County Museum of Art, and the Metropolitan Museum of Art, as well as in numerous other institutions. A fully illustrated catalogue with an essay by art historian Andrianna Campbell will accompany the exhibition.